Amphibian Abstracts: Corn: The First GMO? Do you like corn? Popcorn? Sweet corn? Candy corn? Okay, that one's not really corn, but it's probably made with high-fructose corn syrup. It may surprise you to learn that corn, the grain produced more than any other grain on this planet, was invented by humans. It would not exist on its own. But it wasn't created in a lab by some mad scientist. Thousands of years ago, the indigenous peoples of Mesoamerica created it the old fashioned way - selective breeding. They certainly weren't mad. They were probably fairly happy. By cultivating a wild grass called Teosinte and selecting plants for certain qualities, those early Mexican farmers made the plant we know today as corn. 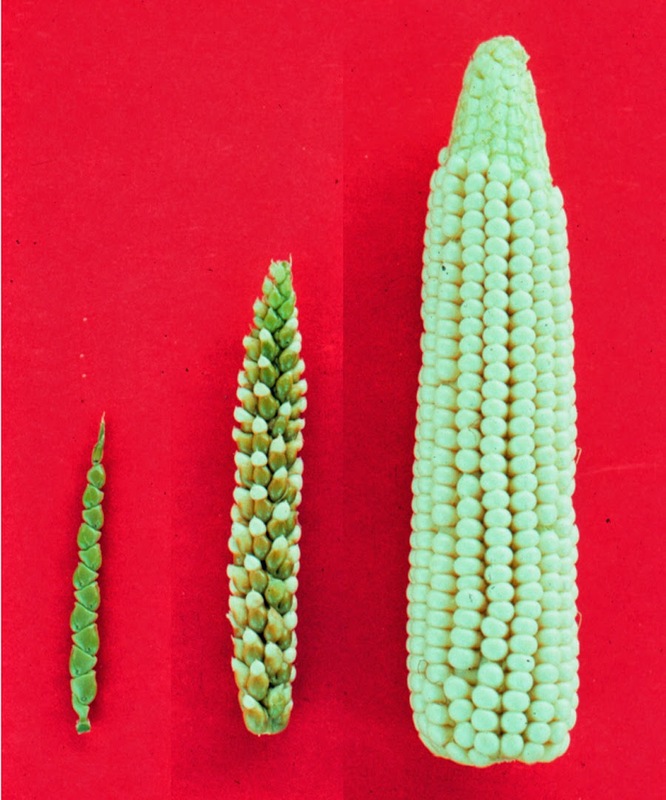 Teosinte (left) and modern corn (right). The middle is a hybrid of them both. So in a way, we have been creating Genetically Modified Organisms since we started farming. By cross-breeding different plants and selecting the ones with the most desirable traits for more cultivation, each generation of food crop was genetically different from the previous one. In a fairly short time, corn went from a plant that could produce one small ear per stalk to a plant that produces many foot-long ears per stalk. That's almost as weird as making fish that glow, and didn't require any test tubes or Erlenmeyer flasks. And corn isn't the only plant to get this treatment! Consider Brassica oleracea. Humans took that plant, wild mustard, and turned it into cabbage, broccoli, kale, Brussels sprouts, collard greens, and kohlrabi. Yes, that's right. broccoli and kale are the same plant! Same species. Brassica oleracea. Totally blew my mind when I first learned this. These are the kinds of things that influence my web comic. Today's was actually a reproduction of one I created back in 2001. It was probably the last one I did before re-launching this year. Back then, there was only one frog, and he only sometimes wore a lab coat. But he did try to analyze the genetic makeup of marshmallows. As far as I know, those were only domesticated starting in 1934 and their genome has yet to be sequenced.